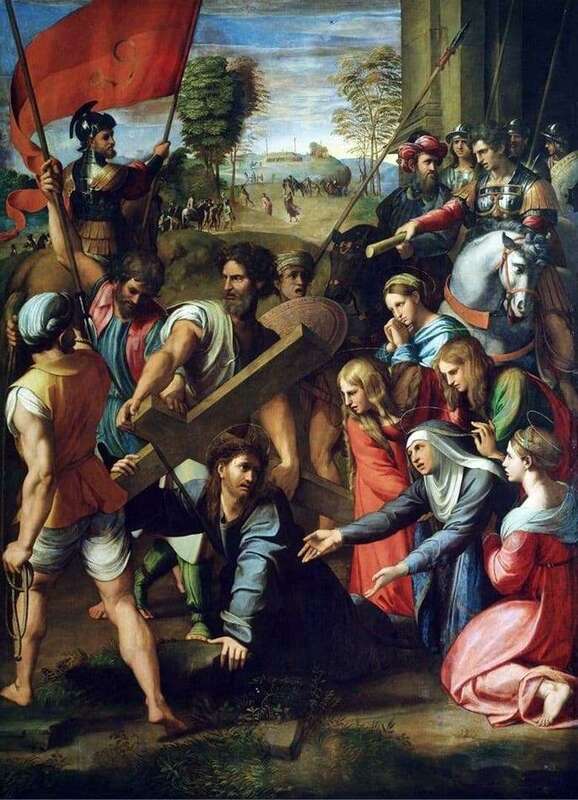 “Carrying the Cross” is one of the most tragic works of Raphael. It conveys not only the moment of their life of Christ, described in religious sources, but also the human emotions that the author so diligently conveyed. The feeling of grief, helplessness, anxiety and compassion is read in the eyes of the Dev in the right side of the canvas. In the center of the picture is depicted Jesus Christ in a crown of thorns, shedding tears and experiencing incredible torment. In exhaustion, he fell to the ground under the weight of the cross, after which he informed the Holy Maidens that Jerusalem would soon fall. After this, Christ looks back at the mother, who rushes her arms helplessly toward her beloved Son, grieving for His fate. The Virgin Mary, despite the enormous suffering, tries to hold on courageously, but does not hide her grief. This moment should become an example for every Christian, who should experience the torments of his Savior as much as the Holy Virgin Mary. This picture is written in an unusual style for Raphael. Firstly, the heroes of the picture occupy solemn, almost theatrical poses, and the main events fit not only in the format of the canvas, but also go beyond it. The color palette of the work is rather saturated, it is dominated by dark shades in a duet with red. This technique helps the artist to convey the tragedy of what is happening, to emphasize the tension and suffering of empathetic Christ Dev. At the same time, the torturers of Jesus Christ are depicted even more expressively, which underlines their rudeness and deceit. Extreme states of the human soul, such as grief, helplessness, empathy and a burden raised on the shoulders of an innocent – all this was conveyed to Raphael in one of the most popular paintings.